Important: A JSPF change takes effect only when you modify a JSP that includes the JSPF. Use the hook project we created earlier or create a new hook project. Open the liferay-hook.xml file from your project’s docroot/WEB-INF folder in Liferay IDE. By default, it opens in Overview mode. This mode, gives you a graphical user interface for developing your hook. You can toggle between overview mode and source mode via their respective tabs for the liferay-hook.xml file’s editor. Select the Custom JSPs folder from the outline to bring up the custom JSP options. Select the checkbox Customize Liferay Portal JSPs and create the default custom JSP folder /META-INF/custom_jsps, by clicking the icon that has the three yellow diamonds. Figure 7.3: Liferay IDE lets you specify a folder for the custom JSPs you’re developing. Create the folder by clicking the icon that has the three yellow diamonds. 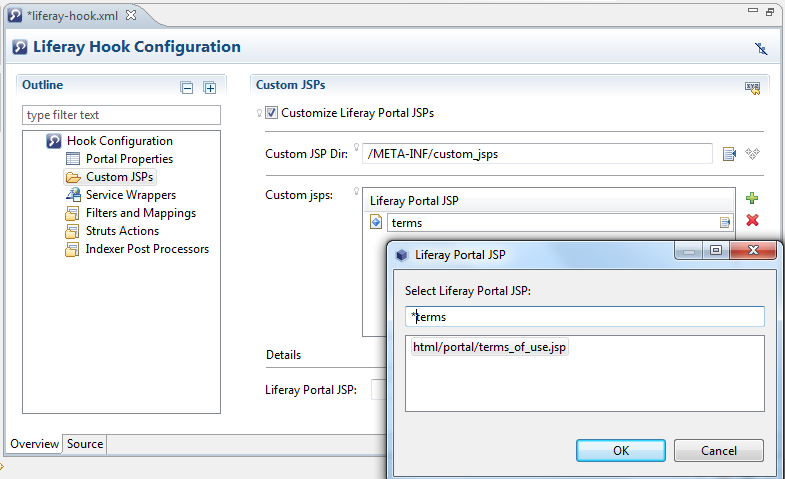 Add to the listing of custom JSPs by clicking the plus icon and specifying Portal’s html/portal/terms_of_use.jsp file. Hint, the browse icon on the right-hand side within the custom JSP text field simplifies finding the JSP you want to customize. It lets you scroll through the JSPs that are accessible and lets you specify key words to narrow your search. Figure 7.4: Liferay IDE simplifies adding a custom JSP to your hook by providing a powerful overview mode for editing your liferay-hook.xml file. Open your hook’s docroot/META-INF/custom_jsps/html/portal/terms_of_use.jsp file and modify it as necessary. Deploy your hook and wait until it is deployed successfully. The original JSP stays in the cache until the cache is cleared or Liferay Portal is restarted. To clear the cache, navigate to Control Panel → Server Administration and click on the appropriate Clear content … buttons in the Resources tab. Next, we’ll look at a different way to customize a JSP.